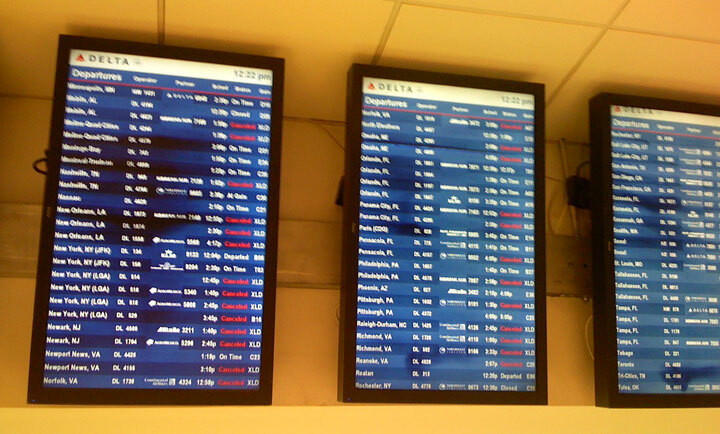 Flights get cancelled all the time and there are not many options one can have in those situations. You can opt-in to stay at hotel or call your friends and family to find out if they know someone in the city, where you can crash for free; or perhaps call a travel agent (if you have one) to see if they can put you on an alternative flight. But sometimes your persistence will help because if one flight is cancelled because of weather conditions, then there may be high chances that at least one flight will take off after a while. Conde Nast says keeps checking with the agents if case if any seats open up at the last minute. When the weather gets bad, there are so many flights canceled and delayed that lots of people are missing their connections and therefore leaving seats empty. I know one person this week who was trying to get home to Chicago from Philadelphia. American was running only one flight that day and it was full. He eventually did make it on that flight, and there were 30 open seats because of all the connection issues.